What with holidays and City and Guilds samples there's not a lot of finishing going on around here at the moment. I did finish one sample though, as I had an idea that I wanted to see through. Right at the end of last term, just before we went on holiday, we were doing Broderie Perse. 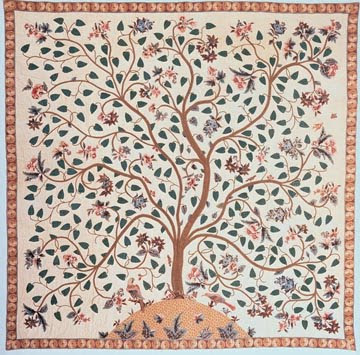 This technique was really popular in Europe in the seventeenth century and one design that people liked to do was The Tree of Life. Now, don't get excited, there was no way that I was going to get into something as advanced as this! I'm not that keen on appliqué. But I found some wonderful fabric with owls on and thought it would be lovely for broderie perse, so here's my homage to The Tree of Life. I don't know about you, but my needles get into a muddle. When I watch something like The Quilt Show, or read various blogs, people talk about using a particular sized needle for a particular job, and I wonder how they keep them organised. I have no idea which needle is which after a while and they end up just jammed into a needle case any old how. So I decided to make myself one which I could label and try to be a bit more organised. I used a bit more of the owl fabric and some felt, fabric and ribbon that I had and put some braid on the 'pages' that I can label with the size and type of the needle. I've only put six pages in, but I could always add more braid to divide the pages if I want more. I wonder if it will work and help me to be a bit more organised? I like what you created with the owls. Owls are so popular now in home decor. Wow, Broderie Perse is amazing! I love your little homage just as much though! I've had the same thoughts about my needles and I really need to make a labellable needle book too... one for the weekend? I'm so glad that I'm not the only one that feels befuddled by needles. I always seem to keep them all clustered and grab whatever is handy. Lovely work on the new technique. The owls are sweet. It sure is a pretty way to stay organized.